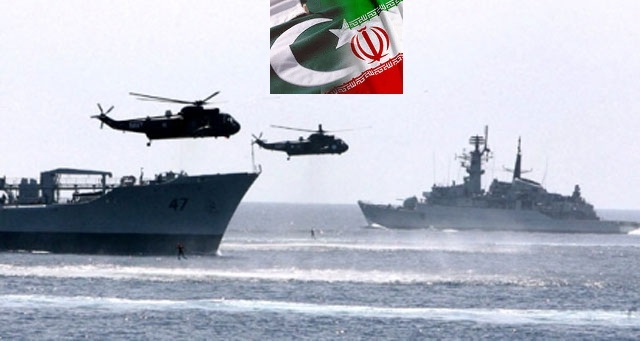 TEHRAN – Iran and Pakistan staged a joint naval exercise in the eastern part of the Strait of Hormuz on Tuesday, according to the public relations department of the Iranian Navy. The exercise was held to promote military relations between Tehran and Islamabad. During the maneuvers, Iranian and Pakistani naval vessels practiced military tactics and adopted various formations. The Pakistani fleet of naval vessels which took part in the exercise was comprised of a missile-launching warship, a supply ship, and an advanced submarine. Pakistani naval vessels had docked at the southern Iranian port city of Bandar Abbas on Saturday morning. The deputy commander of the Iranian Navy for operations, Rear Admiral Shahram Irani, had previously said that during the four-day stay of the Pakistani naval fleet in Iran, a number of meetings would be held between naval officials of the two countries. This entry was posted in Asia Pacific, Iran News, Middle East, Pakistan News and tagged iran, Iranian Navy, military relations, Naval Excercise, Naval Exercise, naval vessels, Pakistan Iran Joint Naval, Pakistani naval vessels, Strait of Hormuz. Bookmark the permalink. ← Dictation or Negotiation By Taliban Terrorists , 7 Shia Martyred within 48 Hrs.